Finding the right neighborhood is just as important as finding the right house, as the right house in a neighborhood that does not work for you can lead to eventual dissatisfaction with the house. Neighborhoods encompass many different aspects so it pays to do your research fully and understand what a particular neighborhood may or may not offer. The perfect neighborhoods for a family with kids may not be the perfect neighborhood for an empty nest couple or a single person looking for a home. This articles looks at some of the things homebuyers should be considering in a neighborhood when shopping for a home. The location of a neighborhood is key. Living in a great neighborhood fifty miles away from your workplace may leave you with little time to enjoy your neighborhood since you have to spend more time driving back and forth to work. So while there may be a great neighborhood fifty miles away that does not mean you should be considering it unless your employer offers benefits like working from home rather than having to come into the office every day. Long commute times can be stressful and result in many wasted hours that should instead be spent enjoying time with your family or enjoying your neighborhood. The neighborhood location in terms of the community amenities and features are also something to consider. Being in a more rural area you are less likely to find recreation centers, shops, malls and other places to go to, but if you enjoy the peace and quiet the rural area may work better for you. If on the other hand you prefer to be close to major shopping areas to the point where you can even walk to some places then you will need to consider that when looking at neighborhoods. Make sure you drive the neighborhoods and drive the surrounding areas to see what is located close by. You may discover great shopping close by or you may discover a farm or industrial area that could prevent you from enjoying the peace and quiet of your home in which case that neighborhood may not be for you. If you have young children living in your household then schools are an important consideration. Whether you need a school close by so your kids can walk to and from school or are looking for schools for a child with special needs start by looking at the schools first and then visit the surrounding neighborhoods. Research local schools online at websites like GreatSchools.org or Niche.com. Once you have narrowed in on some schools you think will work well for your family, schedule an in person visit of the schools. Many schools are happy to meet prospective parents and students and give them a tour of their facilities. Talk to the local neighbors and see how they like living in a particular neighborhood and are they aware of any issues. Many people are happy to talk about their neighborhood and their likes and dislikes about where they live. Ask questions about who the homeowners actually are. Are more of the homes occupied by renters and the actual homeowners are remote investors? The neighborhood may be a little different if most of the residents are renters versus actual homeowners who have been living in the area for some time. Renters are more likely to come and go and thus may not care as much about the look of the home they are living in versus an actual homeowner who may take more pride in their curb appeal and try to keep up the look and condition of their home which can affect the values of neighboring properties. Property values can have a big impact on a neighborhood. Neighborhoods with higher value homes means a larger tax base for local governments to provide services with. Declining property values for reasons like heavy industry moving close by to a neighborhood, loss of a large employer, a general net outflow of population out of an area can lead to an overall decline in the quality of a neighborhood. What once was a great looking park early on may slowly turn to run down park in need of some repair and maintenance that may never come. As a result a certain park or amenity that might have been the initial draw for moving to a neighborhood could quickly lose its appeal if the neighborhood experiences a decline. Taxes can and do vary by neighborhoods so they should be considered when buying in a neighborhood. As noted above with property values if you are going into a neighborhood area that is experiencing appreciation over time, while that can be a great thing for your own home equity when it comes time to pay the tax bill a higher property value will mean higher taxes. Many cities and municipalities have regular time frames where they re-visit property tax values and raise the assessed value where needed in order to make sure they are getting the money they need to provide city services. So if you are already purchasing a home at the top of your price range and buy in a neighborhood with increasing value the taxes you pay will go up too thus possibly stretching your budget. One should never get into a house poor situation of buying a house at the top of their affordability range only to get squeezed later on by increasing insurance or tax costs. The joy of owning that house can quickly turn into a nightmare when the homeowner must balance car payments and food expenses with the mortgage leaving little to no room for anything else. Running up credit cards to make ends meet is even a worse recipe for disaster. Homebuyers thus need to be careful when buying a home and make sure to consider all expenses associated with home ownership. Taxes and the mortgage payments are two that cannot be escaped for long before someone will come knocking and asking to be paid. If you have to forgo home maintenance in order to make the tax or mortgage payment the value of the home on its own will begin to decline as the condition of the home deteriorates. While safety is a concern for everyone not everyone can afford to live in gated communities with 24 hour security and not everyone may like to live in such a community either. Instead look to local police departments and local crime reports to get an overall idea of a particular neighborhood. Go out and meet the local police personnel and talk with them about a particular neighborhood and what they think. Check out crime reports on websites like Crimemapping.com or CommunityCrimeMap.com. 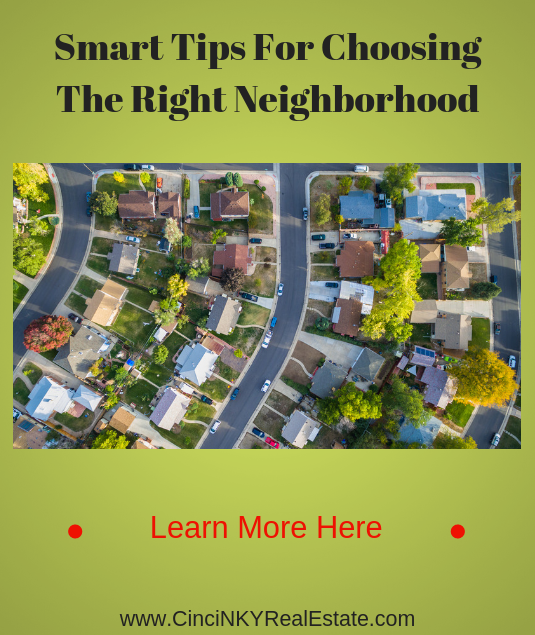 Once you have a better idea of how a particular neighborhood is crime wise you can make a better informed decision about whether you want to live in that area or not. The neighborhood can have just as great of an impact as the type of house you buy. Even the right house in the wrong neighborhood can mean being unhappy with where you live in. 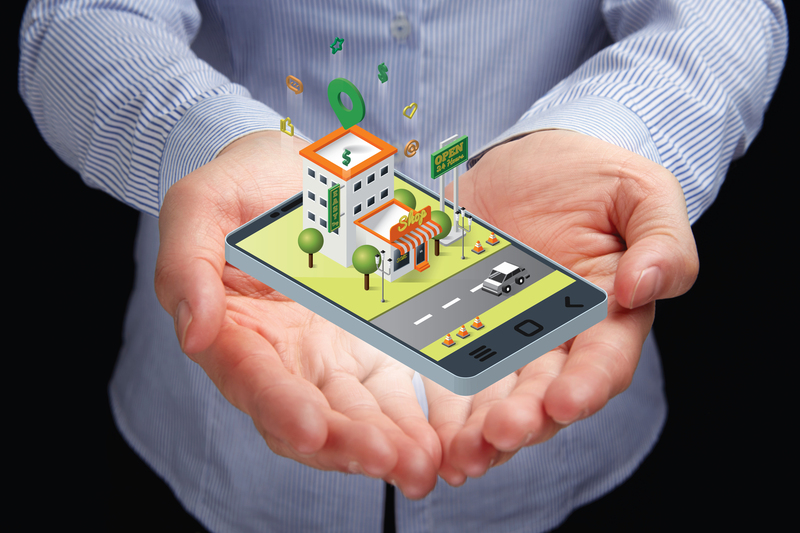 Research and tour the local neighborhoods so you can make sure you are getting what will work best for you. About the author: The above article “Tips For Choosing The Right Neighborhood” was provided by Luxury Real Estate Specialist Paul Sian. Paul can be reached at paul@CinciNKYRealEstate.com or by phone at 513-560-8002. If you’re thinking of selling or buying your investment or commercial business property I would love to share my marketing knowledge and expertise to help you. Contact me today!